Archaeologists excavating a cave in South Korea have found evidence that suggests human beings were using sophisticated techniques to catch fish as far back as 29,000 years ago, much earlier than experts previously thought. 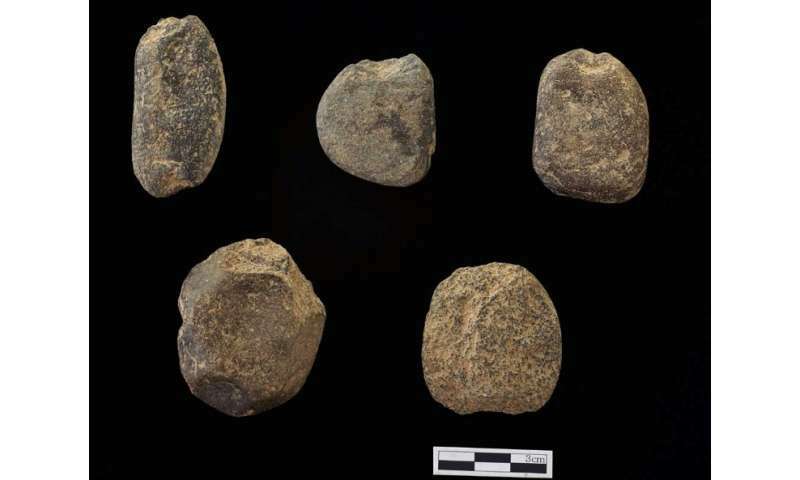 Carbon dating procedures on the fourteen limestone sinkers, unearthed in the eastern county of Jeongseon in June, have pushed back "the history of fishing by nets by some 19,000 years", Yonsei University Museum director Han Chang-gyun told AFP. Previously, researchers had excavated sinkers—stones used to weigh down nets for catching fish—in Japan's Fukui Prefecture and South Korea's Cheongju city, but those discoveries were all dated back to the Neolithic Era and believed to be around 10,000 years old, Han said. "This discovery suggests humans in the Upper Paleolithic era were actively catching fish for their diet", he added. The limestone sinkers, each weighing between 14 to 52 grammes and with a diameter of 37 to 56 millimetres, had grooves carved into them so they could be tied to the bottom of nets and used to catch small fish such as minnows in shallow streams, he said. Researchers also found fossilized bones belonging to fish and other animals, as well as stone tools and flakes, inside the Maedun cave, he said. Prior to the South Korean find, the oldest fishing implements were believed to be fishing hooks, made from the shells of sea snails, that were found on a southern Japanese island and said to date back some 23,000 years.